Monday morning I received a nice email from Lois. She has been following along with Julie & Glenn’s progress, but her husband hasn’t. Tim, you should really be keeping up! LOL! I sent her a quick run through using “The Lick” print (the one prior to this image). 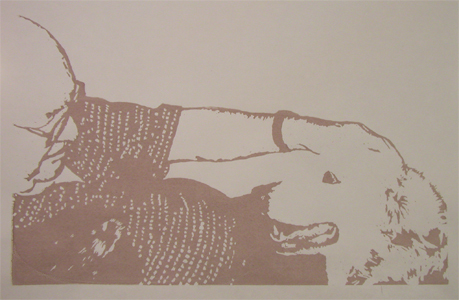 I also mentioned showing the screen for this print, giving him a better idea of what’s going on. 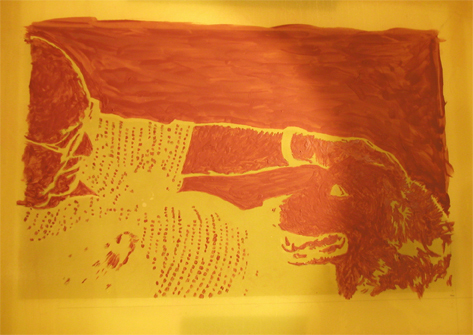 Below is the screen ready to print the fifth color. All the red stuff is screen filler (yellow is the screen) which is applied prior to every color change. It doesn’t get washed out nor do I exchange screens. 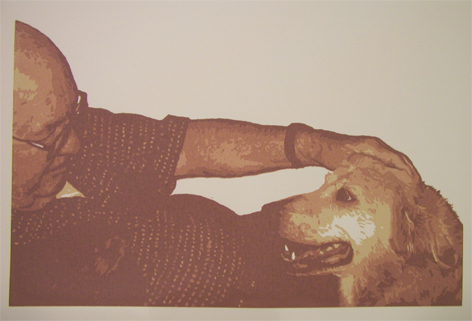 This is what’s referred to as a reduction screen print. One keeps filling/blocking off more of the screen with each change of color. I always run a test on white computer paper to make sure the blockage and color are correct. The results for the above screen are as follows…. So, when I place the screen & ink over the print containing all the previous color changes, you get …. Pretty cool! The remaining two colors will refine the image even more. 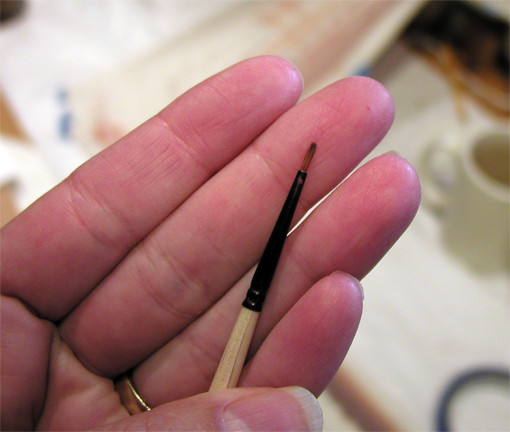 Now, the tool that does most of the technical work is one little brush. I received it during an ArtFest workshop but for the life of me, I can’t recall which class. Who ever it was RAVED about this little brush and made sure we all had one. She must have been a painter… Marybeth Shaw possibly? It’s label says: 3/0 Black Gold by Dynasty. I’m not a painter, so it doesn’t matter much except it works for my application. Guess I better get back to work! You are amazing…and a pretty darned good sister-in-law also! LOL!